An upgrade to BBC ListenAgain. Programmes had started to disappear from the 3.2 version as the BBC moved its ListenAgain archive to its new iPlayer. This version of the widget restores those programmes. - Accessibility: Voiceover use is detected and certain actions are spoken if turned on. VoiceOver users: when selecting stations use VoiceOver keys with the arrows to select the station from the menu. Try and play directly from the BBC website. If it works there then it will almost certainly work in Dashboard. If not the problem has historically been issues with RealPlayer - try uninstalling and reinstalling RealPlayer using the version from the BBC website. Reboot after the reinstall to restart Dashboard. Let me know any other problems. I did notice that BBC7 is now listed simply as 7. But I also noticed that the category listings (as opposed to the channel listings) are gone. Is this due to iplayer changes? Hi Steven. Yes, the changes are due to the way that the BBC have reorganized their web-site. This looks like an ongoing process and some more channels will soon follow I think. I don't think the genres are coming back in the near term though. hello Keilly, I have been using the older version of the widget on my macbook,(3.1) and liking it very much.Thanks for creating it. I wanted to share it with my husband and download a version on his macbook, but I noticed the world service is no longer part of the menu? The BBC are moving their programmes to a new site called iPlayer. The World Service hasn't made it yet. 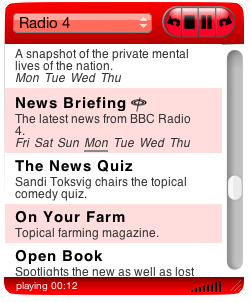 Use version 3.3 of the widget for the new iPlayer site, use version 3.2 for the old. All versions of the widget are available on the website here, click on the 2007->November to see the 3.2 version of the widget.